When it’s time to set a room’s mood, Renaissance Painters are Toronto’s #1 choice for wall design and decoration. In fact, when home stagers and real estate agents want a property for sale prepped, a fresh coat of paint is used to liven up the home. Renaissance Painters chooses neutral colours in these situations to satisfy the pickiest of people, and give the home a younger look. Besides, no one wants to look at tired and dated paint. For new homeowners, an existing white coat should be changed to a colour tone that compliments your personality. Changing the colours of your walls can give your rooms a modern look, as long as the colours you select compliment the room’s fixtures, furniture and accessories. While white paint can make a room seem bigger, it doesn’t determine the mood of the home – its generic, and your home should represent YOU. This is why Renaissance Painters offers you a colour consultation before your home is repainted – to help you determine the perfect colours in a sea of potential selections. With white paint, accumulative dirt and stains stand out, where as coloured walls conceal any imperfections. Maintaining a white wall’s cleanliness is also a chore, one that can be minimized by replacing white with the colour of your choice. You are the one who will look at your walls every single day, so it’s always best to choose a colour that makes you calm and livens up your mood. If your favorite colour is blue, it’s important to select the hue that blends in with your belongings, one that is not too bright, but not too dark either. You might choose not to go with a paint tone at all, but a faux finish instead. With this style, your walls are decorated with the illusion of a popular pattern. The sky is the limit with a faux finish – literally! The pattern could be anything from clouds to a plaid texture. A mural is another alternative to an interior painting job. Some homeowners choose to have an inspiration painted on one (or many) rooms, be it a person or place. Others have their children’s rooms decorated with nursery favorites, or cartoon characters. Customized, hand-painted murals are always a popular choice for any home. As you can see, when it comes to painting the interior of your home, you have a variety of choices. Your colour consultation will help you determine which tone, style or pattern is right for each room. The colour selection doesn’t have to be a hard one – you’ll be assisted and have time to think about the interior decorations of your walls. 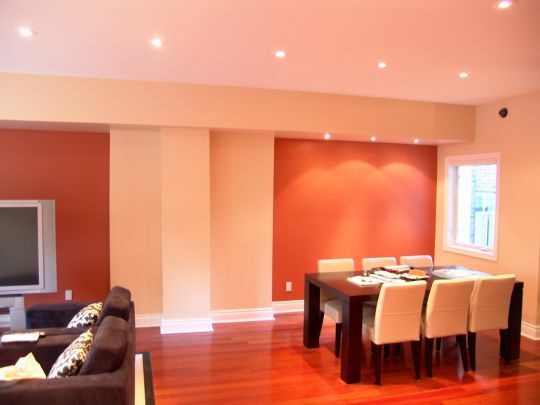 After you have chosen your colours, you’ll marvel at how Toronto’s favourite painting contractors transform your walls into aesthetically pleasing masterpieces. Renaissance Painters have been painting interiors of homes across Toronto for over 22 years, and each project comes with a 100% satisfaction guarantee. For more information, call 416-618-0400 or visit the official website at www.renaissancepainters.ca today!